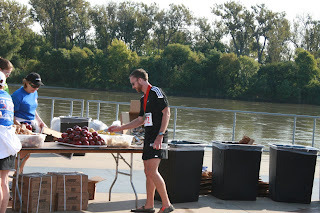 This is the second time I ran the Omaha Marathon, and my second marathon overall. I trained a little harder for this one, peaking at 62 miles per week rather than 40 last year. Last year's marathon was my first, and also the first race that I ran in my Vibram Five Fingers. This is a fairly tough course but having run it last year I felt I was ready for the challenge. My time last year was 3:24:25 and my goal was to be as close to 3:00:00 as possible. I figured I would hang out with the 3 hour pacer as long as possible and if I lost them along the way hopefully I could still be under 3:10:59 and qualify for the Boston Marathon. So the race starts promptly at 7:00 am (maybe a minute or two early, actually) and we are off. In Omaha, they start the 10k, half-marathon and full marathon together since the total is only around 3000 people. The first couple miles I ran around 6:35 pace and have not yet seen the 3 hour pacer. 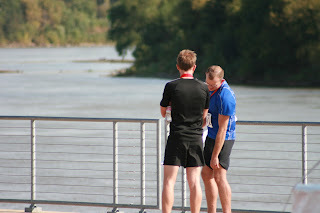 Then, about 3 miles into the race someone passes me and I notice a small "3:00" tag attached to his shorts. I thought they would be holding a sign or have a larger tag, but oh well... I decided to follow him as he weaved through the other various runners. After each mile I looked at my watch and each of the first six miles were right around 6:35 pace. I crossed the 10k point right at 41:00, which is exactly 6:35 pace. I thought it was a little fast, since 3:00 pace for the marathon is around 6:52 pace, but I figured the pacer was allowing for the second half to be a little slower. It got a little crowded around the 10k point because there was some congestion and all of the half-marathoners were still around. Somehow I lost sight of the pacer but decided to keep running at 6:35 pace for a while. 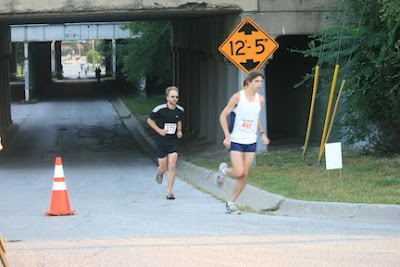 At a water/Gatorade station around mile 10 the pacer passed me, so somehow I had gotten ahead of him. We ran together for a mile or so and each time there was a hill I would pull ahead but on the downhills he would surge forward. We were holding steady for a while until the marathoners merged back with the half-marathoners on a narrow street. It was there the the pacer pulled away. We both reached the halfway point at 1:29 and that was the last I saw of the pacer. It was at the halfway point that I also started slowing down a bit. In the Omaha Marathon the full marathoners split from the half-marathoners for good around the 14-15 mile point, and there the pack thins drastically. I did the next few miles around 7:00 pace and started getting a little lonely. I really enjoy running alone but during a marathon when it gets tough it's nice to have people around. From mile 14 to 18 I didn't really see anybody behind or ahead of me so I slowed down a little without realizing it. A group of people around mile 16 told me that I was the tenth runner to pass that station. At around mile 18 I could see the leaders heading into the park and starting to finish their last 10k. I took a gel from the station and plugged along. I crossed the 20 mile point at 2:18:30, which is right around 6:55 pace. I really wanted to be at three hours but I was starting to fatigue and my body couldn't run as fast as my mind wanted it to. I started the last 10k with some slight cramps in my legs, which was a first for me, and felt very odd. I passed a triathlete (obvious from the zippered shirt) who asked me a couple questions about my Vibram FiveFingers: Do I like running in them? Do they offer any arch support? Yes, I love them. No, not really any support; they do make your feet stronger because of this though! I was still plugging along at the 22 mile point but slowing down. I got passed there by the female that won the marathon. She was looking strong and I followed behind her and her cyclist. For some reason at around mile 24 I really felt like I needed to walk for a few steps. At the water station I grabbed a drink and walked with it for about 2 minutes. It was here that I got passed by a runner around my age who seemed to have two assistants with them. I didn't realize that fact until the last stretch when they both eased off the course to let the runner finish. One was on a bike providing drinks and one was running beside him. I let them pass me but caught up and was right behind them until the finish. It was at the 25 mile point (up a hill!) where the race was getting really difficult. I knew that I needed to hurry: 3:00 was out of the question but if I wanted to qualify for Boston I needed to keep running. No more breaks! I got up the hill (slowly) and headed toward the last part of the race. On the last stretch there were people that had already finished the 10k or half-marathon and were cheering me on. 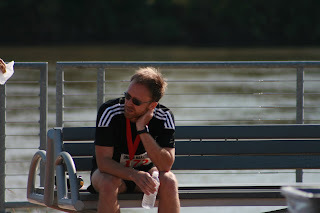 All I could think of was getting to the finish and getting an ice cold water to pour on my head and another to drink. I got across the finish line at 3:06:31 which was good enough to qualify for Boston.